Using a stand up paddleboard (SUP) to explore the water is a little more convenient than a standard paddle board. If you’re thinking about taking on this adventure but aren’t sure where to begin, check out our SUP buying guide. We researched the best brands and top selling items and put together our list of the top ten products. Before we get started, let’s look at some of the key features you need to be familiar with when shopping for an SUP. Pump: All of our top picks come with a pump included, which is good news. Obviously, an inflatable paddle board needs to be inflated before you can use it. It’s nice not to have to buy one separately. 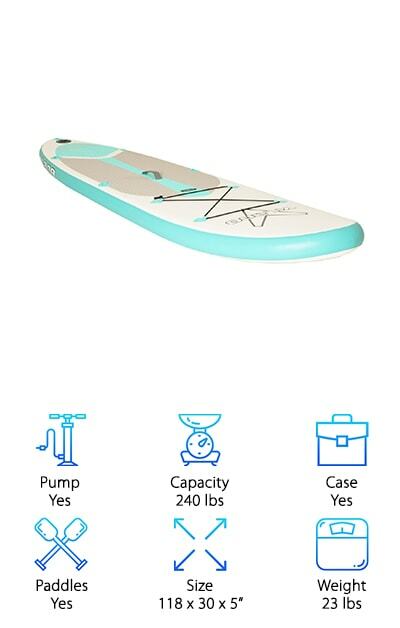 Capacity: The maximum weight varies for these boards. The range varies anywhere from 209 to 350 pounds. Keep in mind that this includes the weight of the rider as well as any gear they might be bringing along. Case: This is another thing that makes SUPs so convenient. Once you’re finished, they simply deflate and go into a case. In all of our picks, the case doubles as a carrying bag, making transport super easy. Paddles: Paddles are a necessary accessory that you need in order to use an SUP. That’s why all of our top picks come with one. Some float, some adjust, and some even convert to a kayak paddle. Size: These are the dimensions of the SUPs when they’re inflated. They vary slightly in length, width, and thickness. The longest boards are 132 inches long, widest is 33 inches across, and they’re all 5 to 6 inches thick. Weight: SUPs are meant to be portable and easy to travel with so weight matters. The lighter it is, the easier it will be to carry to and from the car to the water. How heavy are they? They range from 19 to 42.3 pounds. Now that you know a little more about inflatable SUPs, let’s get to our inflatable SUP review. Whether you want something specifically made for fishing or just want a red inflatable SUP, you’ll find it here. Short on time? Start with our top and budget picks first to get a good idea of what’s available. Keep reading if you can to find out more about the rest of the awesome products we found. All right, let’s get right to our reviews. There’s a reason this SUP from atoll is a top rated inflatable SUP. One of the things that impressed us the most about it is how lightweight it is. At only 19 pounds, it’s about 30% lighter than other models. But don’t think that affects its performance. It’s still a great size for stability and balance and has 2 layers of PVC material so it’s still and durable. 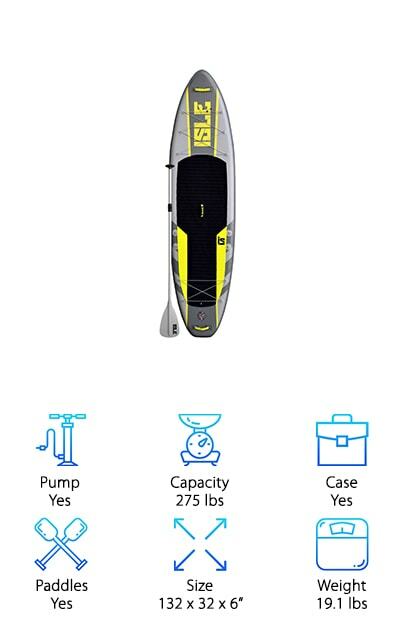 You get a lot of extras with this one, too, including a dual action pump, repair kit, front and rear bungee tie-downs, and a lightweight adjustable oar. There’s also an adjustable fin that’s compatible with all universal fin boxes. What does that mean for you? No extra tools or screws. It just slides into place. Want to upgrade your fin later? It’s also compatible with aftermarket fins, too. This Hydroforce White Cap SUP is one of the best inflatable SUP boards for the money. It’s made of 3 layers of reinforced polyester mesh core that’s encased in 2 layers of laminates PVC. In other words, it’s really strong and rigid. The design is also really great. It has 3 fins for stability. They also make it easier to change direction. Plus, it had a non-slip traction pad and a deck handle that makes it really easy to carry around. 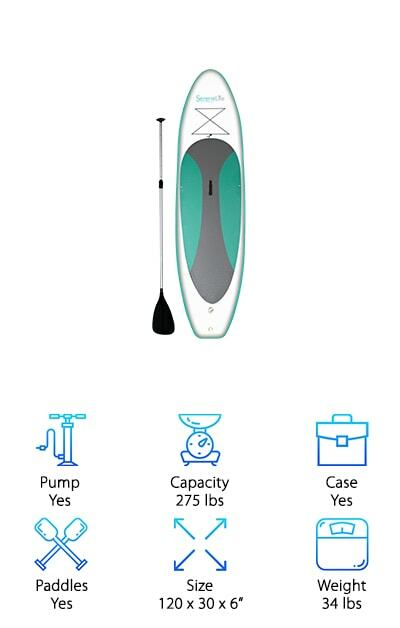 It comes with an aluminum oar, travel bag, pump, and gauge. And get this. 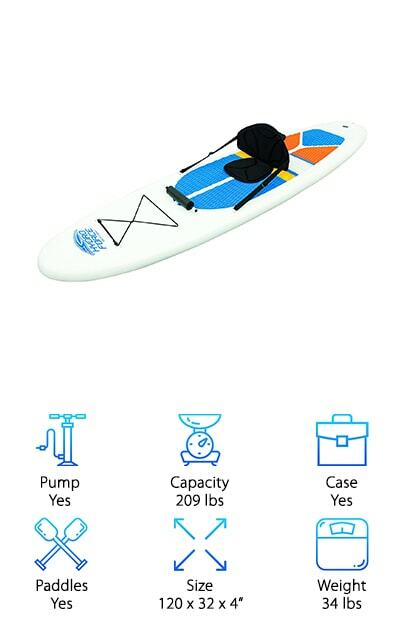 You can use this SUP as a kayak, too, thanks to the included kayak seat with backrest. Just attach it when you feel like sitting down to paddle and remove it when you want to stand again. The Pathfinder Inflatable SUP is, in our opinion, is the best looking inflatable SUP for sale. We love the bright colors and simple graphics. You can choose from eye-catching orange or bold blue. That’s not all it has to offer, though. The PVC material and multi-layer drop stitch make it strong and durable. The deck pad is a generous size plus there’s a bungee to secure cargo and a D-ring for a leash. 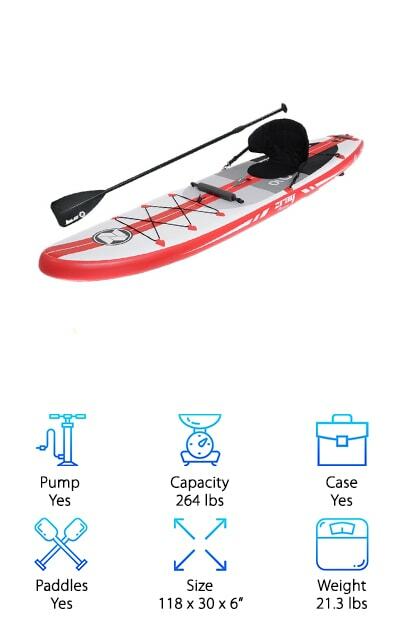 It comes with a lot of nice accessories, too, like an adjustable aluminum paddle, a pump, removable fin, valve wrench, and a carrying bag with shoulder straps to keep it all together. When it’s inflated, it feels just like a hard-board. 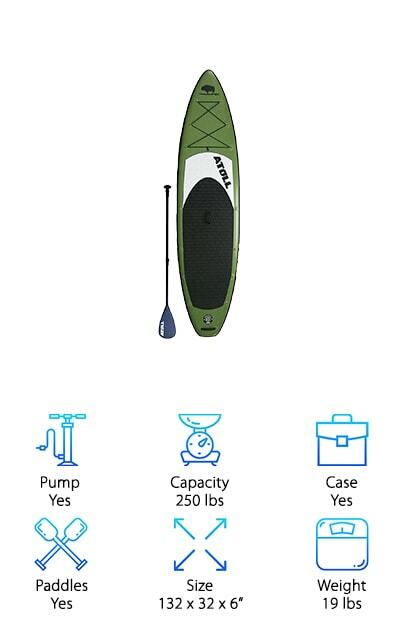 This is a great SUP that’s easy to transport and store. That’s not all. It comes with a 1-year warranty. For a wide, stable SUP that’s great for kids, teens, and adults, check out this one from SereneLife. The wide design provides a lot of stability and helps keep your balance. Plus, for a little extra help keeping upright, the desk is made of non-slip soft material that’s both beginners and experienced paddlers will love. The body is made of PVC, which means it’s stable and hard but won’t hurt as badly as a hard-board if you fall while you’re learning. The handling is great, too, because the triple fins on the bottom panel help with steering. We love that this is a complete kit, too. It comes with everything you need to get started right out of the box. Like what? How about an oar, manual air pump, safety leash, and storage bag. The ISLE Surf and SUP is our pick for best inflatable SUP for surfing because it’s great for all skill levels. Use it for yoga, surfing - anything, really! It’s also able to perform in a variety of conditions so it can grow with you as you practice and prepare for more difficult waters. It comes with a lot of great accessories, too, so it’s super convenient. What all do you get? A paddle, carry backpack, coil leash, and a pump. Basically, everything you need to get right out onto the water. One thing we really liked about this one it that it’s 6 inches thick so you don’t have to worry much about dings or any damages. Oh, and it comes with a 1-year warranty. If you’re looking for the best inflatable SUP for fishing, this one from Zray is definitely one to consider. Why do we say that? For starters, it’s made of durable material including a military grade outer skin that stands up to dings and scratches. There are 3 fins so it’s super stable and easy to maneuver. It has a removable seat, too, so when it’s time to stop and try to get the fish to bite, you’ll be comfortable and able to relax. When you’re done for the day, simply roll it up and put it into the carry bag. It’s really lightweight at only 21.3 pounds so it’ll be easy to carry along with your gear. A lot of great accessories are included, too, including a pump, adjustable paddle, and 3 fins. Here’s another all-around great choice that would work great as an inflatable fishing SUP. First of all, it has an impressive weight limit of 350 pounds. It’s wider than a lot of our other choices at 33 inches across. That gives you a lot of room to get comfortable while you’re fishing. Even the cargo area is oversized so you have a place to safely stash your gear. The accessories are pretty great, too, including a fiberglass paddle that’s really lightweight and floats. 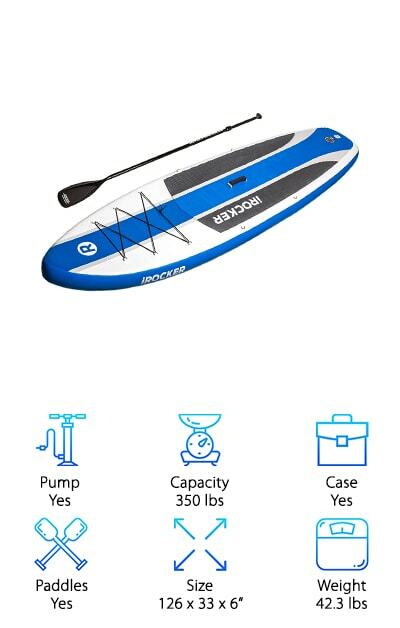 There’s also a dual action hand pump that can inflate your SUP super-fast. The carry bag is really impressive, too. It has room for the deflated SUP and all the accessories with a little room to spare. Plus, the padded shoulder straps and waist support are super comfy. Vilano has a lightweight, durable SUP that we had to include in our inflatable SUP reviews. It really does feel very similar to a hard-board because it’s made of high-grade PVC material and drop-stitch construction. The deck has diamond grooves on the surface to give you some traction and better grip. Not only that, but there are also stainless D-rings and a bungee on the front of the board to give you some storage space. Even though it’s awesome when inflated, one of the things we like the most about it how compact it is once deflated. It’s only 1 foot in diameter which makes it easy to carry and transport. 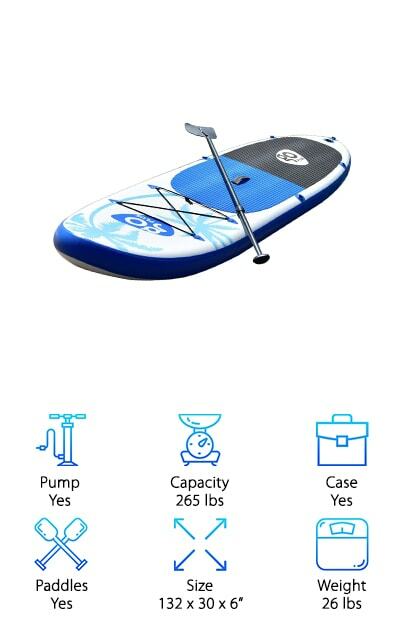 You get everything you need with this one, too, including a 3-piece adjustable aluminum paddle and pump. Another great option if you’re looking for a lightweight board, the ISLE Airtech Explorer weighs only 19.1 pounds. Because it’s made of military grade PVC, it’s also extremely durable and can stand up to dings and dents. They use a process where the drop stitch is coated and sealed before adding a second layer. One of the things we liked a lot about this board is the amount of onboard storage available. There are large front and back bungees where you can store supplies for your adventures. With nose and tail carry handles, it’s easy to get this one in and out of the water, too. 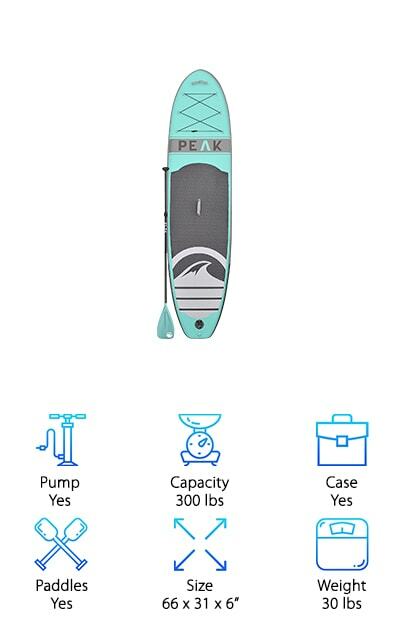 Plus, it comes with a paddle, pump, travel fin, and handy carry bag so you can keep everything together and always be ready to get out on the water. If you’re looking for an inflatable board that’s great for all skill levels, here you go! The drop-stitch construction makes this SUP from Goplus really sturdy. In fact, it can hold up to 265 pounds and can stand up to dings and dents. We really liked how quickly this one inflated and deflated, too. It only takes about 5 minutes so you don’t spend a lot of time waiting around. The bungee system gives you some storage on the front of the board. 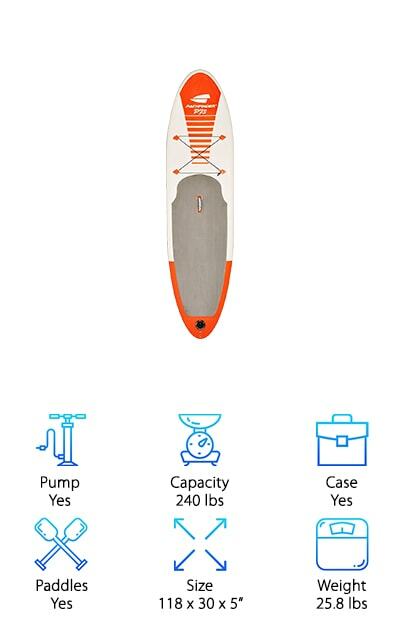 Plus, it also includes carrying handles, a hand pump, repair kit, fin, and lightweight paddle. In other words, just about everything you need. This is a great choice for all skill levels. The foam deck is soft and textured so it’s not only comfortable but also gives you a non-slip grip.